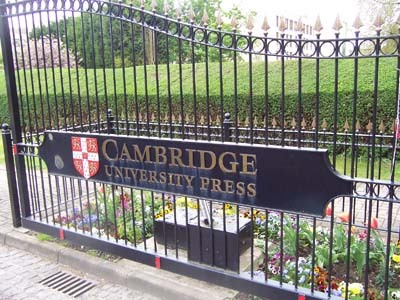 As you sweep into Cambridge station, you pass the massive buildings of the Cambridge University Press lining the track. Clearly, this is not a couple-of-dusty-old-fellas-in-moon-spectacles-working-away-on-a-Gutenberg kind of operation. Indeed, the Press is celebrating its 425th anniversary in 2009. This is the anniversary of continuous publishing anyway, it being 475 years since King Henry VIII stopped divorcin’ and beheadin’ long enough to sign off a ‘Letters Patent’ to the University allowing them to print “all manner of books”. Wikipedia ends its quote from the original Patent document there, missing out the King's all important addendum ‘(preferably filthy)’. 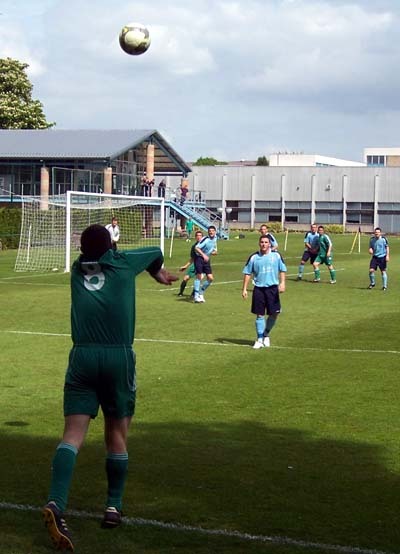 It is in the grounds behind these buildings, in the large Wonka-esque walled community, that Cambridge University Press FC play, in a modern facility built for purpose. 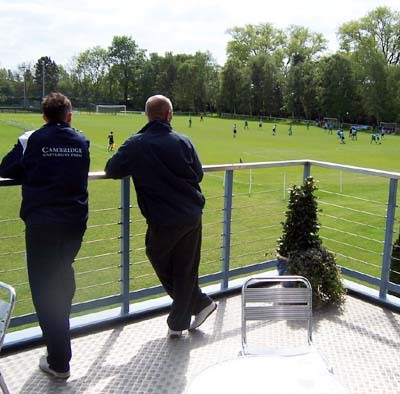 The CASS Centre’s glass heavy pavilion is a little removed from the pitch, largely because the field is also used for cricket meaning the football arena is half-permanent-barriered, and half-roped-off. Coming into the grounds through the ostentatious gates, the CASS being a bit further along behind some buildings, the rest of this Vatican City of print is tranquil and a little eerie for it. It is as if someone had once shouted “STOP THE PRESSES!” and all the workers took this as their cue to flee Cambridgeshire. Turning the corner to the sports arena, there were a few cars around, and the teams were beginning their warm-ups. As I climbed the steps up to the empty bar, CUP officials were working through the fees and mileage claims of the referee and his assistants. Beneath the balcony someone was asking if anyone fancied a game of cricket the next day. There is a distinct ‘club’ atmosphere about the place certainly, like those involved have been around since old King ‘Enery last contemplated a ‘naughty’ parchment. Or at least since the club’s formation in 1893. “Got any match balls”, asked one of the linesmen. “Yeah we’ve got two” replied a Press official, “we did have three but Ely [City Reserves] nicked our other one”. As a result of this, throughout the game, the Press assistant manager constantly had to run behind the far goal to retrieve the strays, after quickly throwing on the spare. Based on this, you’d imagine the Cambridgeshire League wasn’t exactly high octane. Had you watched the first half an hour of the game, which went by chanceless, you’d have rubber-stamped that first thought as hard fact. Perhaps this is what this level (step seven of the pyramid, thus the eleventh of English football overall) is supposed to be about: leafy environs; a transient crowd that dribbles in and out (this game having a crowd fluctuating between about 25 and 45); the sound of a successful appeal in a cricket match happening a couple of fields along; and a league from which ‘promotion’ is rare and thus naturally less intense. The last team to be accepted by the Eastern Counties League Division One were Fulbourn Institute in 2005 but they only lasted a season before withdrawing over ground-grading issues and dropping to the Cambridgeshire League’s second tier. However, they have worked their way back up and are this years Premier Division champions. Whether they are yet ready or willing to have another crack at Step 6 is not yet clear. So, with not much to play for in this game, aside from the home side looking to pip Lakenheath to second place, it all made for a relaxing neutral watch, but we can partly blame the ever present sunshine for that. I bet this place, without any cover or hard standing, doesn’t feel anywhere near as hospitable in mid January but I’m a sucker for the lower rungs when it’s May and pleasantly balmy. Ordinarily I wouldn’t watch football at this level, particularly in a pyramid league which contains (*cough, spit*) reserve teams (this division housing Histon A, as well as Ely and Newmarket’s stiffs) but there’s something about a team named after an academic book publishers that has long intrigued me. In the end, the Press were good for their clear dominance and better standard of play. They finally broke the deadlock after 35 minutes, and in fine style. Caught in the corner, a Press midfielder impressively flipped the ball up over the defenders allowing substitute Lee Crick to knock it forward with an outstretched toe. With space on his side he was able to tap it past the keeper. Within a minute of that, they’d made it two, a shot from the edge of the box curving past the keeper’s dive. Following this a group of shirtless blokes turned up tapping a few balls around. It turned out these were members of Cambridge’s reserve side who would start their match against Fowlmere, in the Cambridgeshire League’s Division 2 A, on the pitch the moment the first team had cleared off. There was still a further 45 to get through though, but it all passed comfortably for the home side. After a brief period of Littleport pressure, the away side were suckered by a 50th minute third, Press’ bustling, heavy-duty midfielder crashing through before threading a pass that could be slotted comparatively easily home. Not long after Press’s left back crashed a rocket shot against the underside of the bar which bounced up and hit Littleport’s keeper but, luckily for him, spun wide of the post. Undeterred, Littleport did manage to pull one back against the run of play on the hour. A lovely cross was levered in with an outstretched foot, to the sound of much moaning about off-side. CUPFC’s sealer came in the 64th minute and in comical fashion. Press’s right back strolled into the box before threading a pass across the six yard area. Not that any of his team-mates got anywhere near the ball, Littleport’s keeper having got their first to artfully palm it in through his own legs. A 4-1 win wasn’t good enough to lift them to second however, Lakenheath having won their final game against Waterbeach 3-2. Mind you, Littleport turned up in a rather elegant green, and took a similar beating. It seems it doesn’t matter what you wear, just as long as you are there. For the majority of this game, Littleport didn’t appear to be in the vicinity at all, allowing CUPFC to just walk through them. Their players would have done well to take some inspiration, prior to kick off, from the Chinese government. Those fellas wouldn’t have allowed the Press anywhere near as much freedom. *rough guess which takes into consideration the club officials and reserve team players turning up for their game.